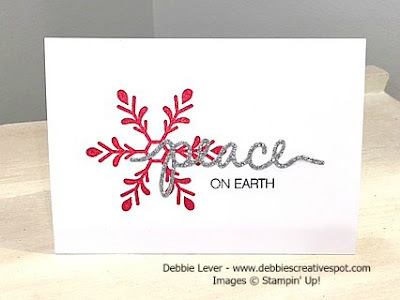 A very quick and simple card to make using the Holly Jolly Greeting's stamp set and Christmas Greetings Thinlits Dies. Using the Whisper White Note Cards and Envelopes makes these cards even quicker to create ( 20 to a pack for $6.00 ). Ink the snowflake stamp in Real Red ink and stamp on the front of the note card. Take the Peace Thinlits Die from the Christmas Greetings Thinlits Dies and a piece of Silver Glimmer Paper and run through the Big Shot. I used the Precision Base Plate which gives a nice crisp cut and the paper removes easily from the die. Place the cut out word on the card base without adhering and stamp the words on earth using Basic Gray Ink. By doing it this way you can stamp the words just where you want them to be. Use the Fine Tip Glue to adhere the word peace to the card.